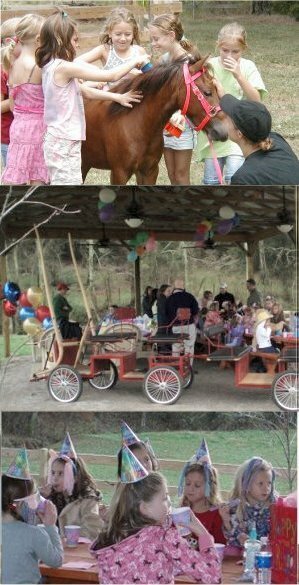 Parties are held in our Pony Party Paddock, a fun, safe, fenced area where kids can play games and have fun on our horse farm. The Paddock includes a covered picnic pavilion, providing shade, fans and seating. Bathroom facilities are near by. On party day, your pony receives a bath and is carefully groomed to ensure he is extra clean for your child's special day. Sinks for hand washing and hand sanitizer are always available. Adjacent to the Pony Party Paddock is a sandy, enclosed riding arena where the kids enjoy hand led pony rides. For the safety of the kids and the ponies, ponies are always led by an experienced, adult handler. For an extra special experience, each pony ride completes a obstacle course that includes a bridge, maze, see-saw and playful cutout images. When not riding, the kids have an opportunity to brush and decorate the petting pony. They can brush and comb his hair, put ribbons and glitter in his mane and stickers on his toes! The petting pony is always a big hit with the kids. Everyone always has something to do and a pony to interact with, so no one has to stand around and just wait for their turn to ride. At the end of the party, the kids pile in our pony cart for a fun and exciting ride through the pasture adjacent to the party pavilion. For all parties, we provide drinks, plates and napkins. You may bring your own cake.